With the launch of the latest Celebrity Cruise ship, the Celebrity Silhouette, just around the corner, we thought we would give you a quick preview of what to expect from this solstice class ship. 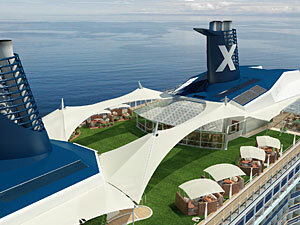 The Silhouette will have 10 restaurants for passengers to choose from, covering cuisines from all over the world. There will be French food, Asian food, Italian and of course a good old fashioned grill/steakhouse for those that like American food. The standard rooms will be slighly larger than their counterparts on other cruise ships, and a whopping 85% of them will have balconies. Although not everyone is looking for a balcony cabin, this does seem to be the way that most cruise ships are going these days, so clearly the demand for balcony staterooms is very high. The Celebrity Silhouette will also have 17 more cabins than it’s sister ships, bringing the grand total capacity to 2,884. One of the most significant unique features of this new Celebrity ship is the Lawn Club Grill which is an outdoor, interactive speciality restaurant. For $30 pp, you can have high quality burgers, pizzas, sausages (the usual foods you would find on a grill) and you will receive an interactive demonstation on how to cook it. At dinner time, you can even choose your perfect cut of meat and grill it alongside the professional chefs working at the Lawn Club. Obviously if you would rather they did it for you, that’s possible too! There is a lot of excitement surrounding the launch of this new celebrity cruise ship, and there are now just 3 weeks to go until the official launch.